If you are a senior who need a basic cell phone service, we recommend you go to the no-contract cell phone plans, which also called prepaid cell phone plans. With that type of phone plans, you have more control over your spending on the phone service since, there are no hidden fees, you just prepay for a specific amount of minutes and/or texts that are available to be used within a specific period. Here we will review some of the best no-control cell phone plans for seniors available in the market. Some lesser known cell phone providers are using one or more of the four major carriers networks, they are called Mobile Virtual Network Operators (MVNO), with these companies, you will get cheaper plans with the best coverage and reception offered by the major carriers. 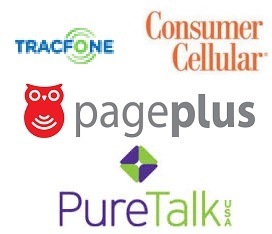 Some of the companies that offer affordable no-contract cell phone plans for seniors are Consumer Cellular, T- Mobile, Tracfone, pages plus and more. The Consumer Cellular company is an MVNO that runs on the AT&T network; this company is targeting the senior market and offer cell phone plans catering the seniors' needs. Consumer Cellular offers affordable no-contract cell phone plans for seniors, the cheapest plan will cost you $10 a month with no minutes included, and you will pay $0.25 for each used minute, it’s a good choice for seniors who rarely use their phones and emergency users. The next cell phone plan offers 250 anytime minutes a month for $14.99 per month. With Consumer Cellular you can get a seperate text messages/data plans starting as low as $2.5 if you need. Tracfone company is another company that offers plans look decent for seniors. The plans come with affordable prices and excellent connectivity since Tracfone uses the major four networks. The monthly plans from that company start with the Tracfone 50 Value Plan, which gives you 50 minutes you can use them anytime for a month and will cost you only $10 per month, with no international long distance charges and $0.20 per additional minute. PureTalk company runs on the AT&T network, with the Senior addvantage plan 80 from PureTalk you can get 80 anytime minutes per month, for only $5 per month and the option of unused minutes will roll over to the next month. The PureTalk senior plan is one of the plans that you should consider when choosing your plan. The Page Plus Cellular company uses the Verizon network and offers the pay as you go cell phone plans, which start as low as $10 per month for 100 anytime minutes ready to be used for 120 days. And the unused minutes will roll over to the next 120 days, if you don’t use your phone too much, this is a really cheap plan for you.